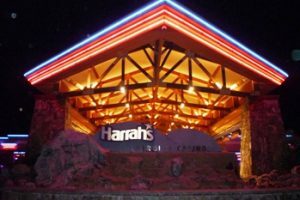 Harrah’s Casino, near the Cherokee Lodge Motel in Cherokee North Carolina, is 80,000 square feet of thrilling casino action 24 hours a day! 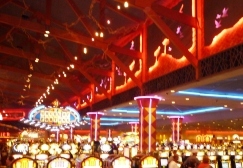 Harrah’s Cherokee features over 3,500 video gaming machines that includes Video Poker and Digital BlackJack. 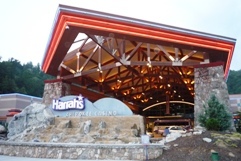 Harrah’s Casino in Cherokee features over 850 poker-based games, including Double Double Bonus, Jacks or Better, Deuces Wild, Bonus Draw, Three Card Poker, Let It Ride, and many others. How much you want to play is completely up to you! You can put down a nickel or a $100 bill. 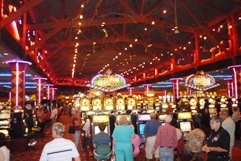 Harrah’s Casino in Cherokee also feature the ever popular Pot O’ Gold games. 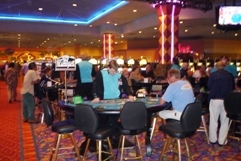 Pot O’ Gold games include Black Gold, Eight Ball Poker, Shamrock 7’s, Triple Sevens and more. Harrah’s Cherokee Casino invites you to join in on the fun and excitement of table games.With live dealers and real chips, their modern style table games offer a unique format of traditional table games but with the latest interactive video technology. Whether you’re anexperienced player or new to table games, every hand is a new opportunity to win! 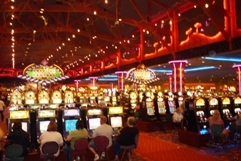 Take part in the fun with a fast-paced game of D21 also known as Digital Blackjack. 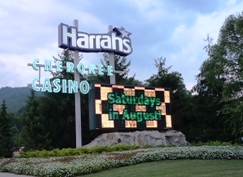 Digital Blackjack has become the most popular table game at Harrah’s Casino in Cherokee.The digital version of this popular game includes live dealers, real chips, a six deck shoe, and Las Vegas rules to create an exciting table game experience for the players.